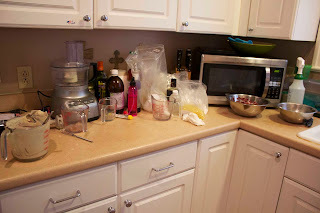 So far Jolene M has created 35 blog entries. Don’t you just love the fun of the 100th day of school? 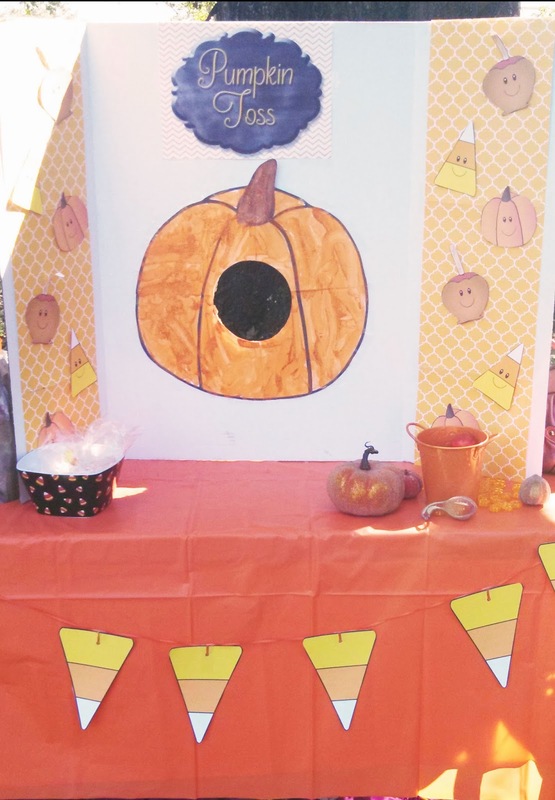 Counting the days of school is such a great, fun way to incorporate number recognition, counting skills, place value, and more! My favorite count the days of school activity is to have the students count the straws. 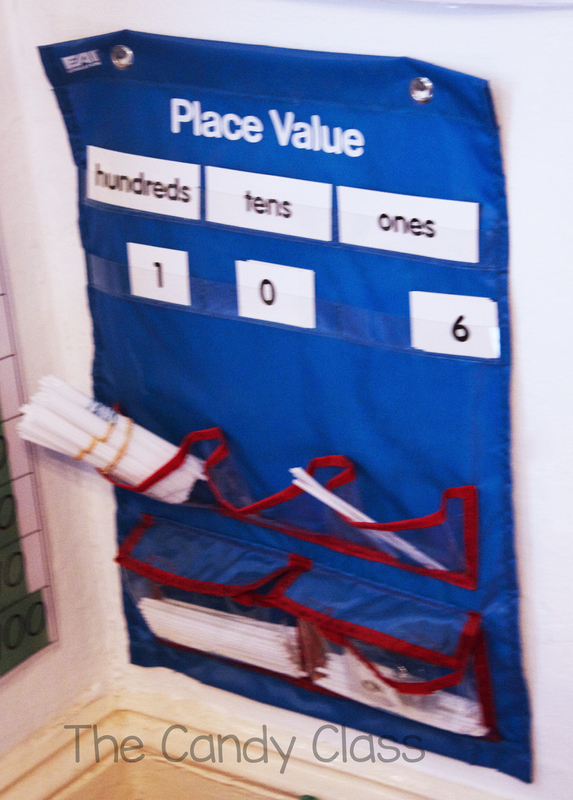 I love it because it sets the foundation for learning the abstract concept of place value. Let’s just face it, if kids are thrown this suddenly in first grade without any concrete foundations, a LOT of kids are not going to get this concept. I’ve had students that struggle daily with math, and still grasp the concept of the tens and ones place halfway through a year of kindergarten. 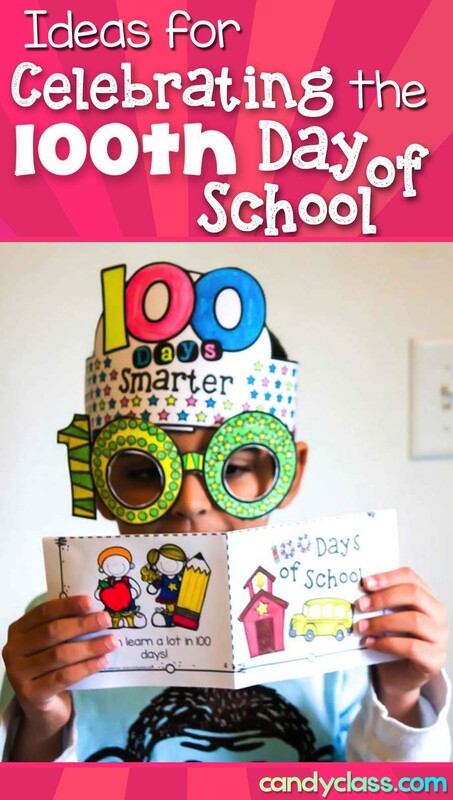 Then when we get to the 100th day of school! Bam, they get the hundreds place too! So if you are teaching primary students or homeschooling a k-2 student, and you don’t count the days of schools with straws, chains, or something similar….start! You won’t regret it! 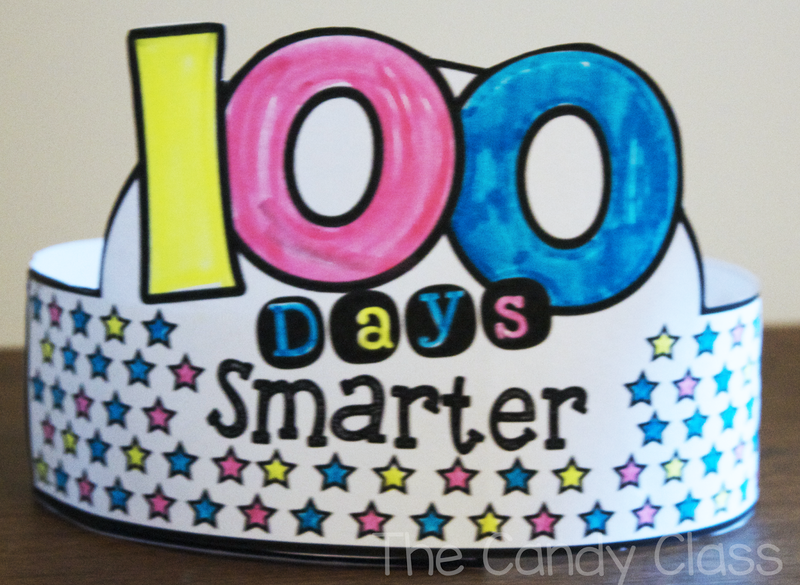 Children that are a 100 days smarter deserve a celebration! For celebrating, they can be crowned. Once they are 100 days smarter, they have a new view on life. 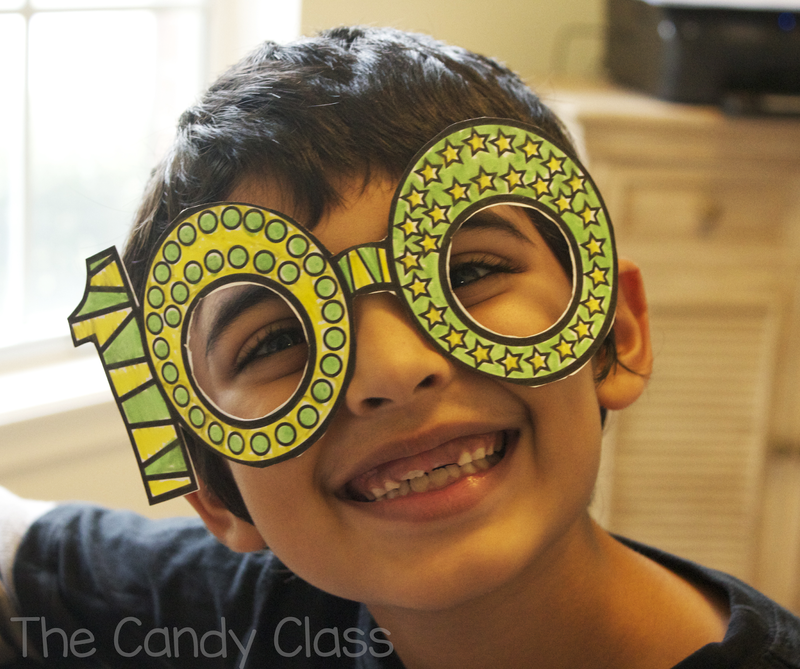 Why not celebrate that with some 100 day glasses? 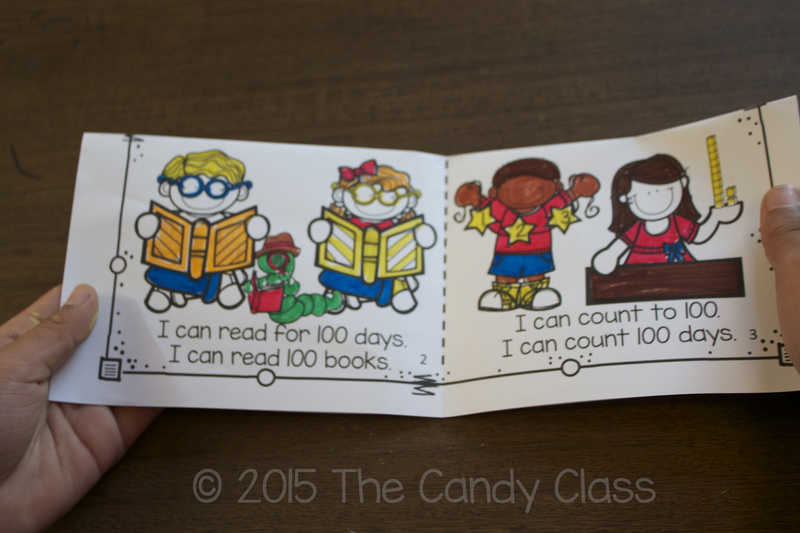 They can count to 100 by 1’s, 2’s, 5’s, and 10’s. 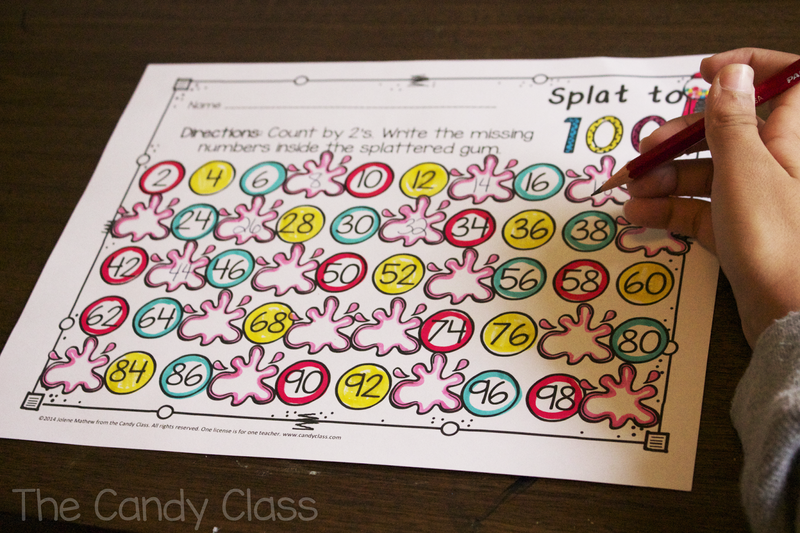 This one is the splat to 100 sheet, where they count by 2’s and fill in the missing numbers on the splattered gum. 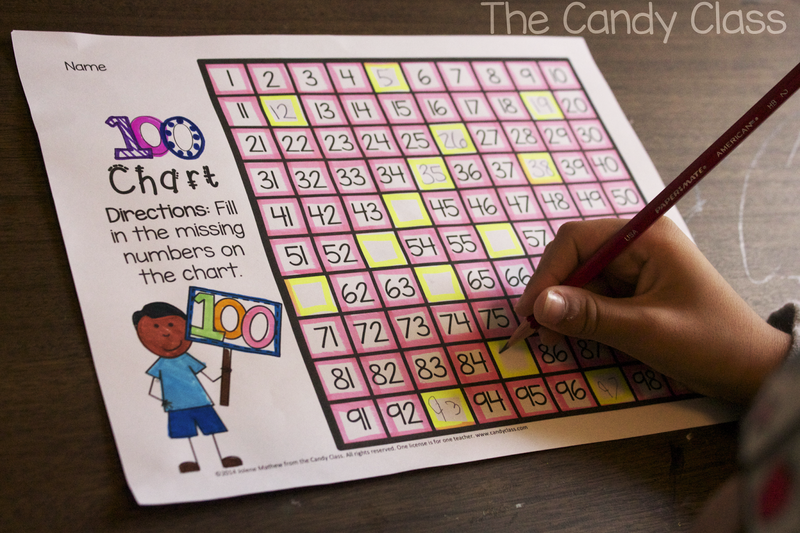 They can fill in the missing numbers on a hundreds chart of write all the numbers in a hundreds chart. 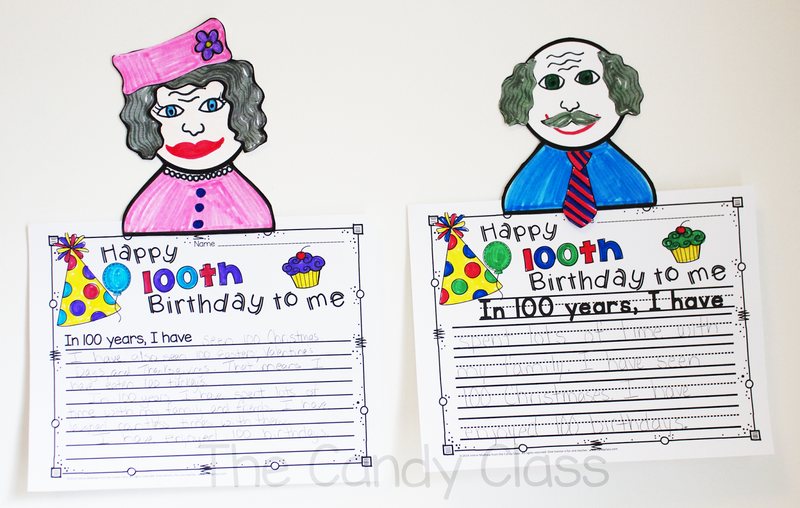 They can write about celebrating their 100th birthday. 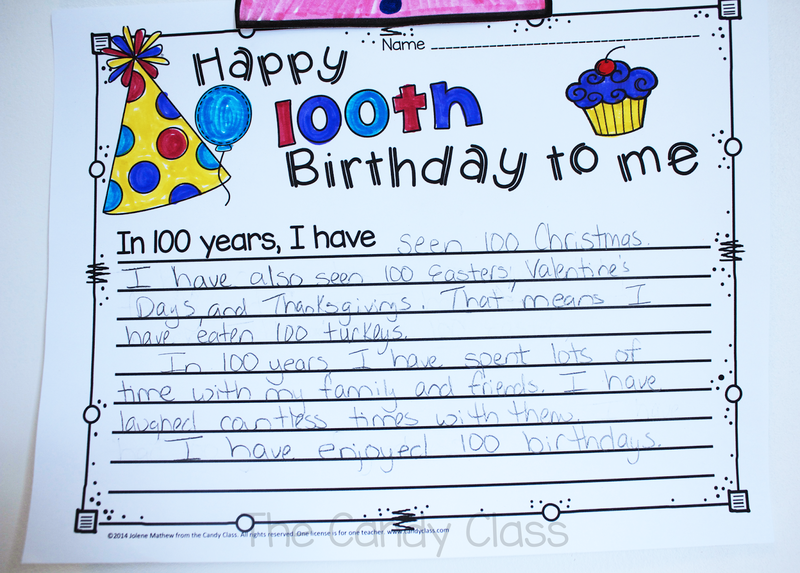 And yup, 100 birthdays does possibly mean eating 100 turkeys, lol! This writing activity is fun, and it offers room for some very cute creativity. 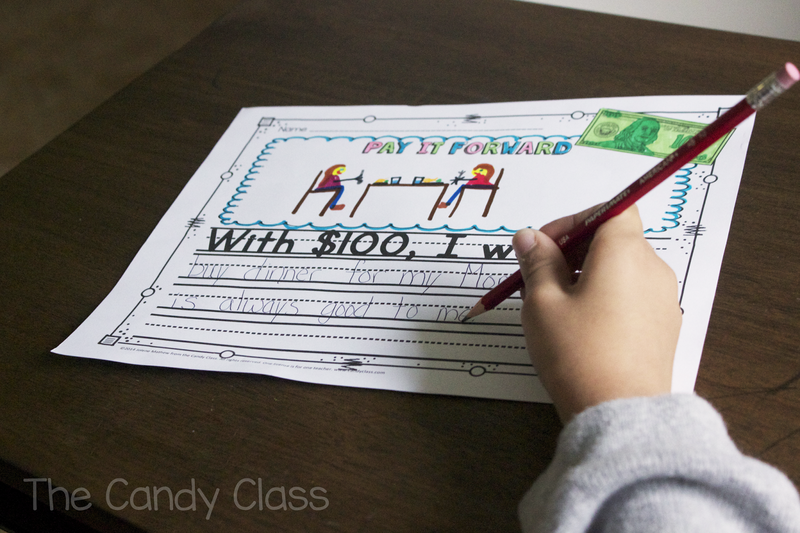 They can think of ways to do kind deeds by having $100 to pay it forward. We want to encourage good citizenship after all! 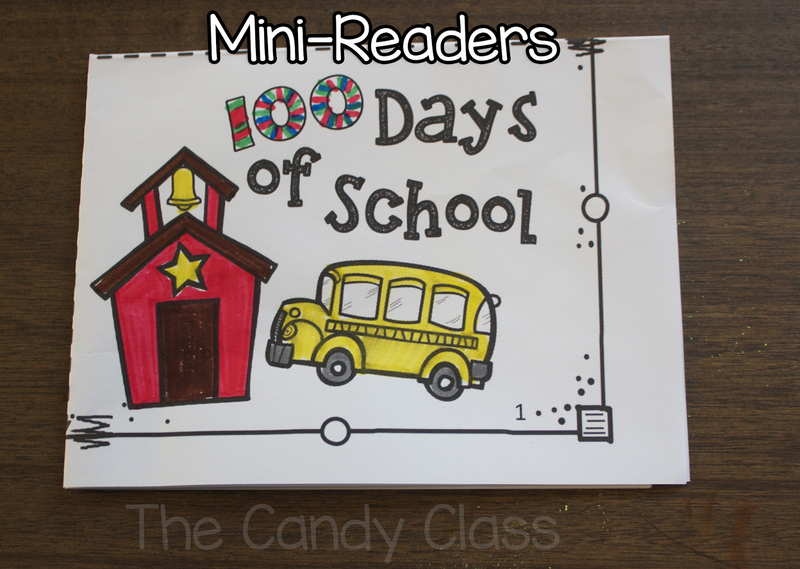 They can read about the 100th day. 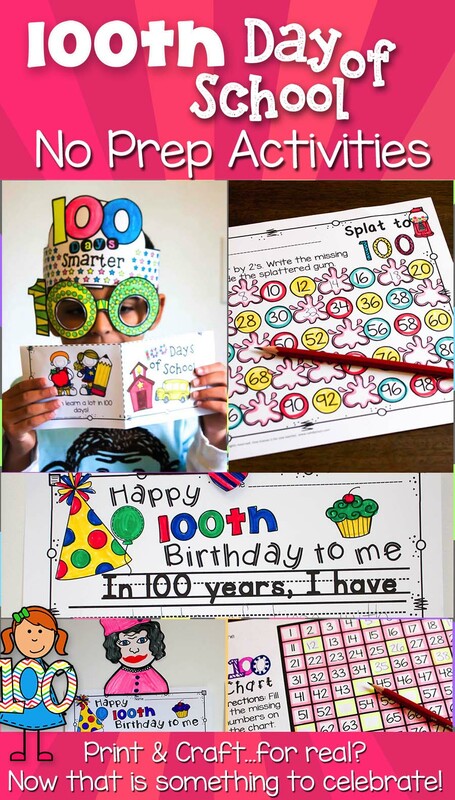 (Drumroll) Teachers can save 100 hours of work with this no prep 100th day of school packet that is complete with fun crafts! Just print and craft! 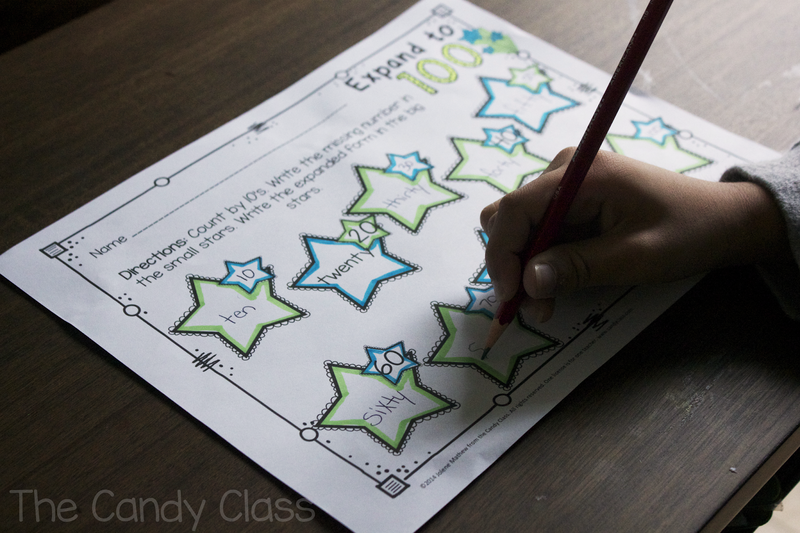 It includes several math printables incorporating that number 100, leveled Mini-Readers, writing craftivities, and extended writing activities too. Find it here or click the image below. You can also search http://bit.ly/100DaysofSchoolNoPrep too. If you would like to hear more ideas for the classroom, make sure to subscribe by email in the right column. Thanks for stopping by for a visit! Today, I am “interviewing” the accordion template. 1. What is an accordion template? 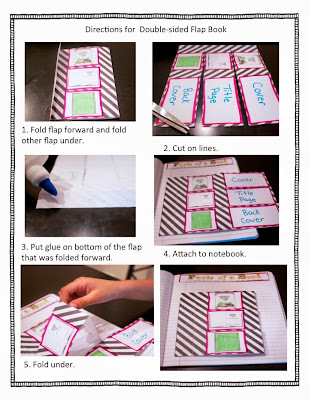 An accordion template is a unique type of interactive notebook template. It consists of a paper that is folded just like an accordion. Now sometimes that paper can be shaped like a rectangle or it can even be shaped like a bunch of bears. The folds in the accordion leave separate spaces for adding educational content. 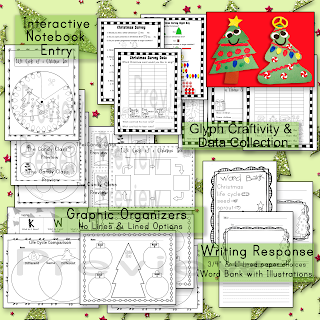 These are great for students because they become a very unique graphic organizer that literally pops off the page. 2. How can they be used? 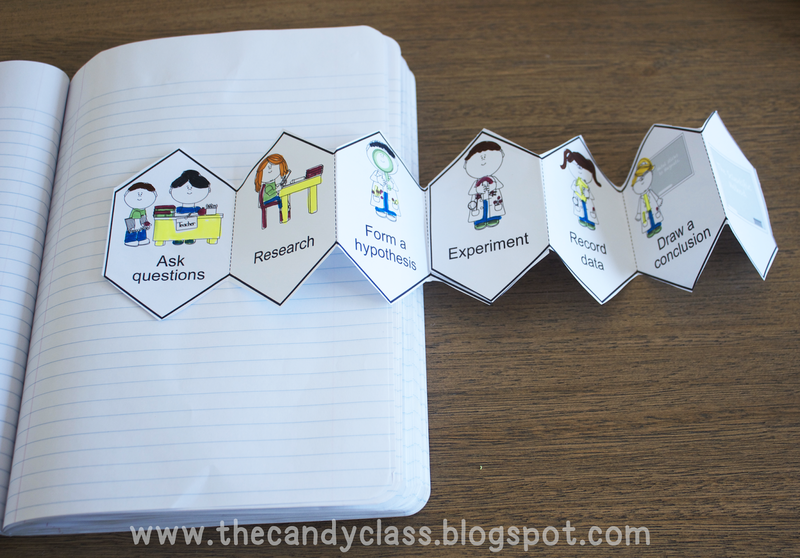 Since the accordion functions like a graphic organizer, think about using these for lessons that need to be filled with connecting information such as processes, chronological order, order of events, and steps. They are good for phonics activities. Patters- Accordions are great for teaching color and number patterns. Number Patterns- Students can add missing numbers and/or do some skip counting. Science- Learning the names of planets, parts of the body, or steps to the scientific process are all ideas that fit great with accordions. Spelling Lists- Why not have students write their spelling list on an accordion to keep handy in their notebook for reference? •Order of events such as story sequencing or historical time lines. •The steps to the writing process can be recorded on an accordion. •Math Facts- You can write math facts on these, and students can put them out to practice memorizing their addition or multiplication facts. 3. How else are these handy? Accordions are also handy because you can get a lot of information on them without taking up a gigantic amount of notebook real estate. 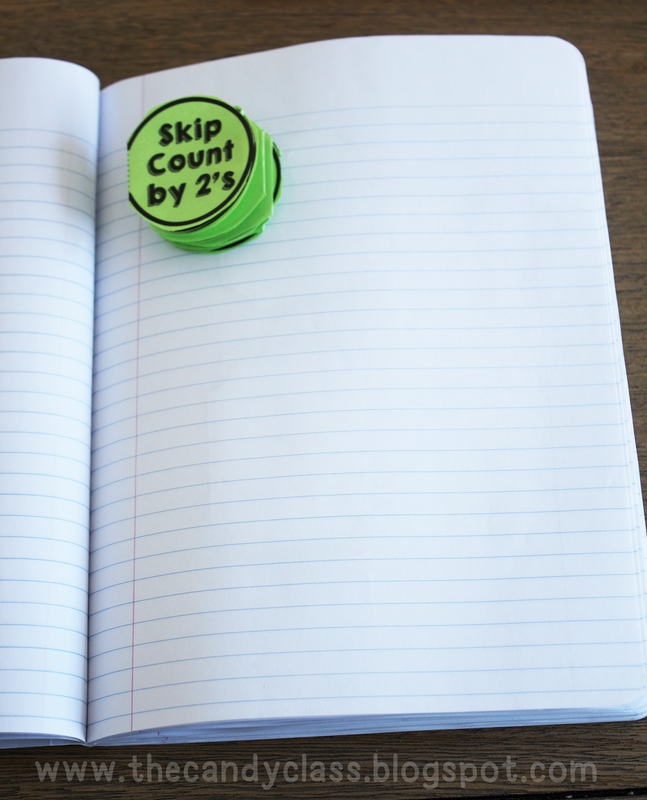 If you look at this entry, you realize you can not only squeeze counting by 2s on the page, but you can include other types of skip counting on the same page! The same can go for adding spelling list. You can fit multiple spelling lists all on the same page. 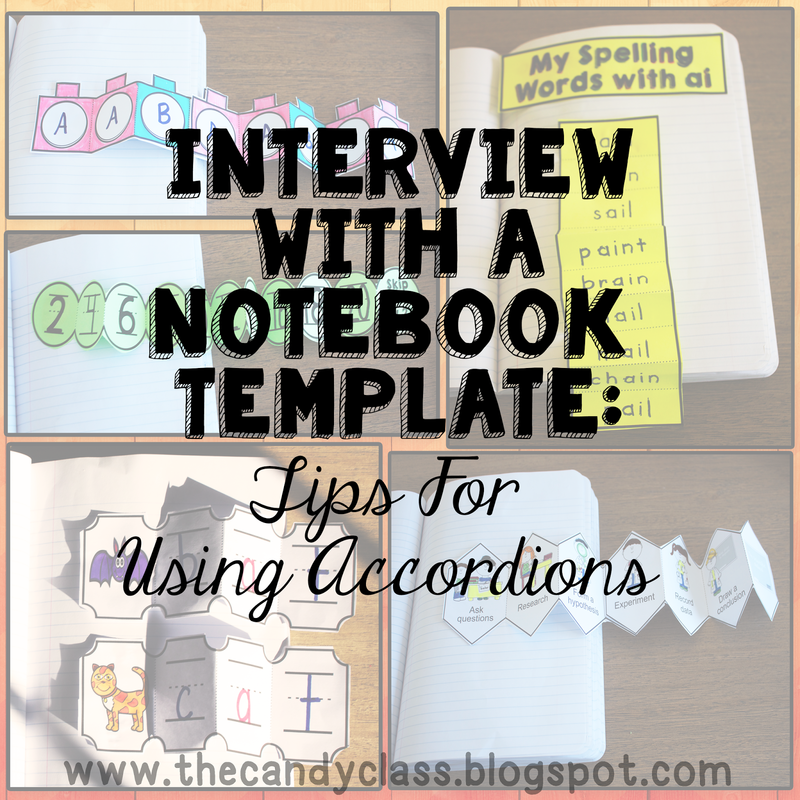 These accordions have lots of potential to maximize space in a notebook. 4. These seem complicated to make. How can I make these and get everything else done? True, creating accordions take some design skill because essentially they need to flow. Now you could just place a bunch of squares together in PowerPoint. However, if you are telling students to cut on the solid lines. That is going to get confusing when you have solid lines running in the middle for folding. Good news, I create interactive notebook templates that are quality made in Adobe Illustrator at 300 ppi. The outer solid lines are for cutting, and the inner dotted lines are for folding. Less confusion, more productivity in the classroom. And these templates save you a TON of time because they are already made for you. All you need to do is add text boxes and images, and you are set to go. I even include a tutorial on how to do that! This set includes all my accordion templates in one set. They come in png images and editable PowerPoints, include visual directions for the different types of templates, and a reference guide with a name system to help you find just the right template easily. Click on the image to link. 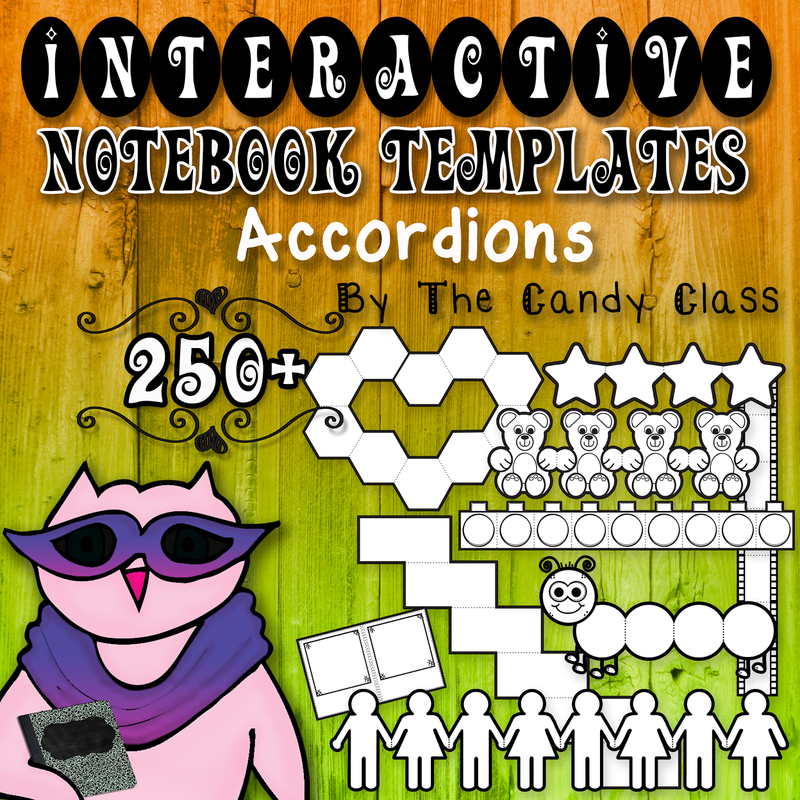 Many, but not all, of the accordions from the set above can also be found in my Interactive Notebook Templates 1000+ set. This set includes over 1,000 templates from many different template types. Click on the image to link. 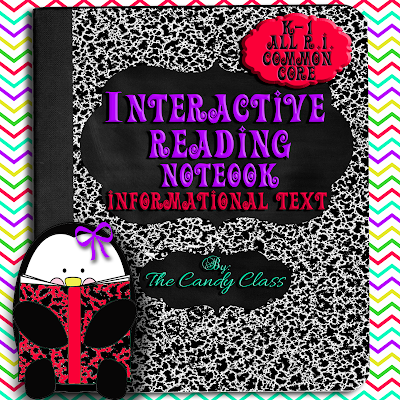 You can email me questions about interactive notebook templates at teachcandyclass@gmail.com. Make sure to stop back by. I will be offering tips on a bunch more template types in the future. 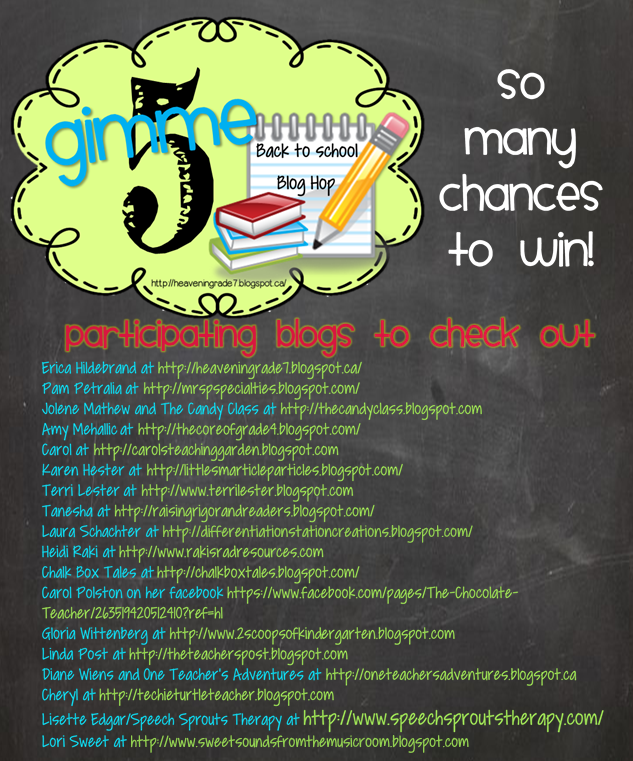 Ok, my friend at Mrs. Hildebrand from a Grade 7 Heaven is hosting a Gimme 5 Blog Hop. You can link on any of the Gimme 5 images to her blog to hop on. She has a list of everyone participating there. Here is a list of everyone participating. Click on the image to hop on. Hi everyone! 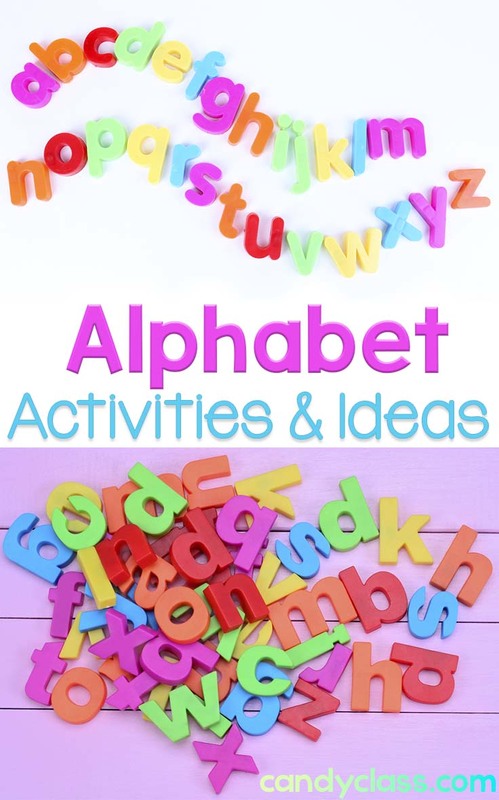 Today, I wanted to share some engaging alphabet activities and ideas to help students learn those letters and beginning sounds. Ideally, all first graders should come to class knowing these. Even in kindergarten, they really should know these. However, you know there is always at least one that is having a hard time with this very important foundational MUST. It is for that reason that I have a bit of an obsession with scouting alphabet activities for children to help them get over this hurdle. And well, maybe it has grown kind of unnatural, lol! I mean, giving a lady stink eye because she grabbed that Beanie Baby at the yard sale that stood for the missing letter I needed for my alphabet stuffed toy collection might have been overboard, lol! Sorry lady, but I saw it first! 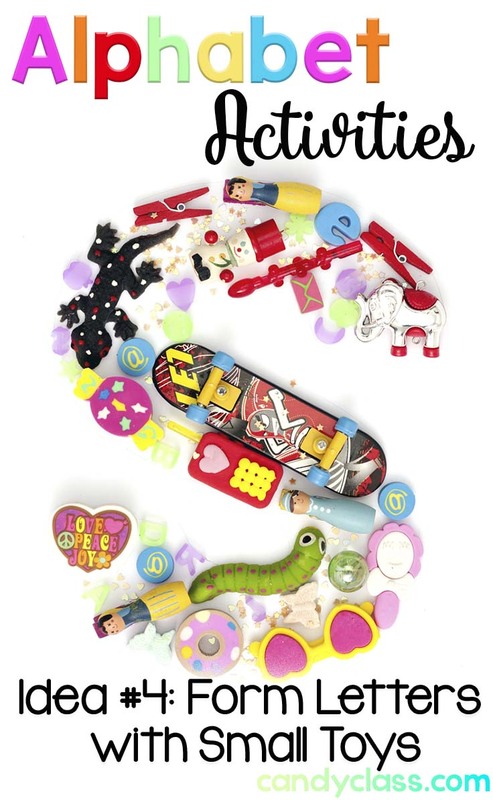 Or getting excited like a kid to see a bin of tiny knick knack toys that might help complete my collection of small alphabet manipulatives at my age is not very becoming, haha! Ok, so I have an abnormality with the alphabet. But maybe it is not. See, I want to see all kids succeed, and if they are going to succeed, they need their alphabet foundation to be solid. I believe it is important to find multiple ways to teach the alphabet to keep it interesting for students struggling in this area. 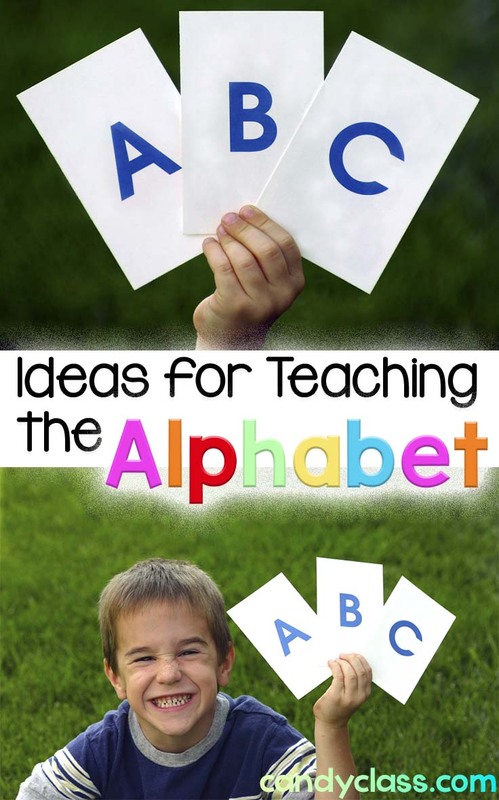 With that said, here is some alphabet teaching inspiration to keep that alphabet instruction engaging, hands-on, and fun! 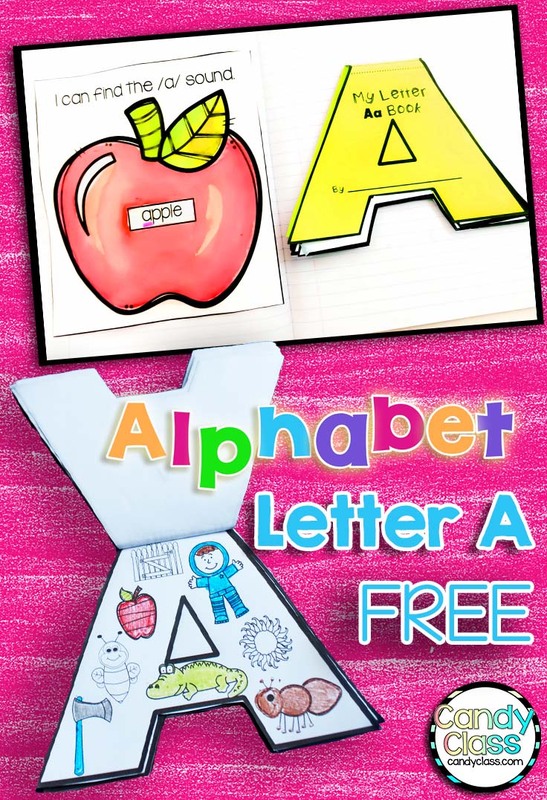 I also have a free alphabet resource to share with you also. These are handy for the letter of the week or letter of the day. You can let those who are struggling to learn their letters hold them too! You can use these as part of a sorting activity. 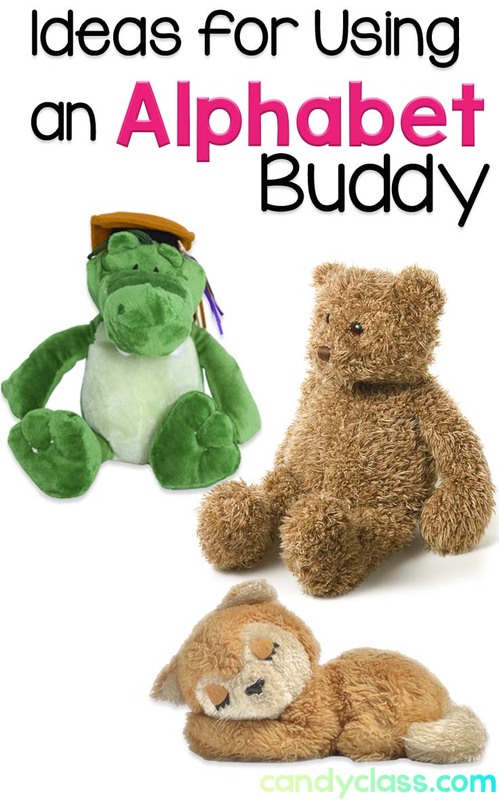 Students can lay the pictures that make the same sound as the alligator by the alligator doll. You can have students place them in alphabetical order. I did my collecting of these at yard sales. Snag up some small notebooks. I snagged up a pack at the Dollar Tree with several in one pack. 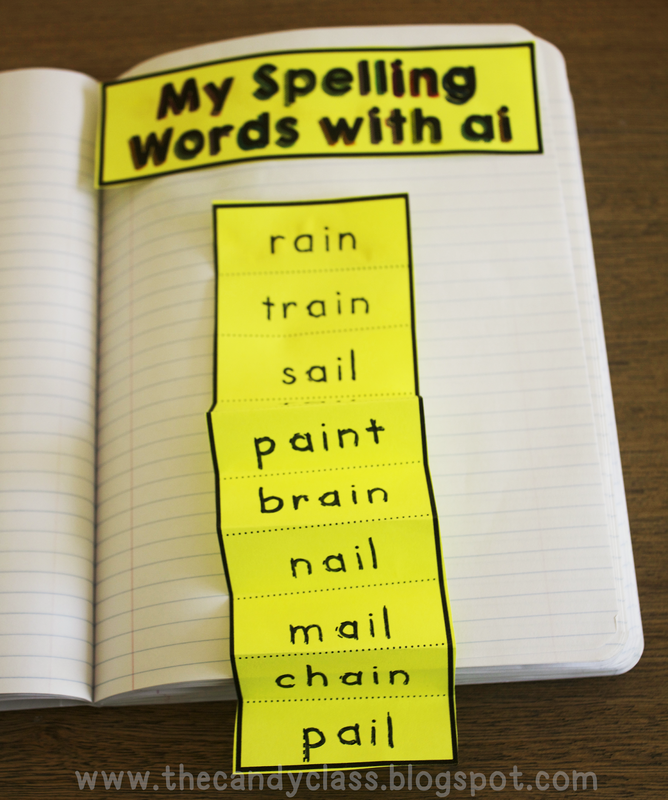 Students can use them to record words they find that start with that letter. They can also illustrate some of the words too. 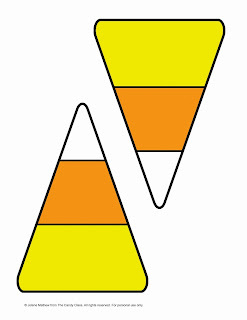 Add cups of small items in an alphabet center for students to use to form the letter of the day (or week). Then have them make a textured rubbing later on after it is dried. Sorry for no pic on that one yet. Have them line up those toys on a letter card! This duals as a fun sensory activity, and helps students who are struggling with remembering how to form those alphabet letters. 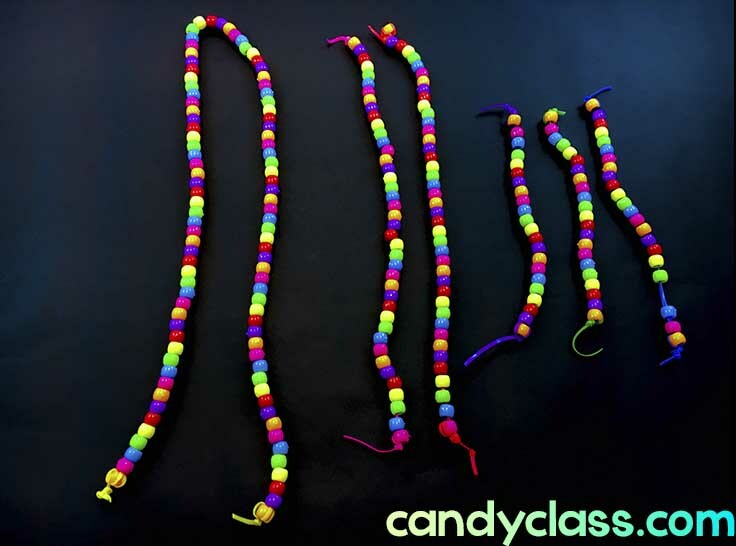 Another method similar to the toy formation is to to use some pony beads to form bead chains in different sizes. 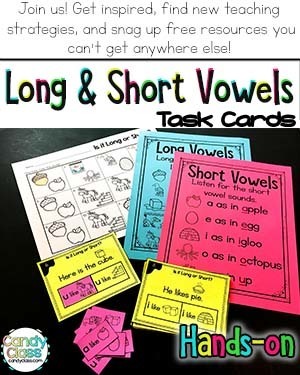 Students can then use them to form letters. For struggling students, you can provide some letter mats for them to form them on top. Here is the different size bead chains I used for the letters. You will want multiples of each size, of course! If your unsure on what sizes to create, if you do have some letter mats, you can use those to help you make the different sizes needed. 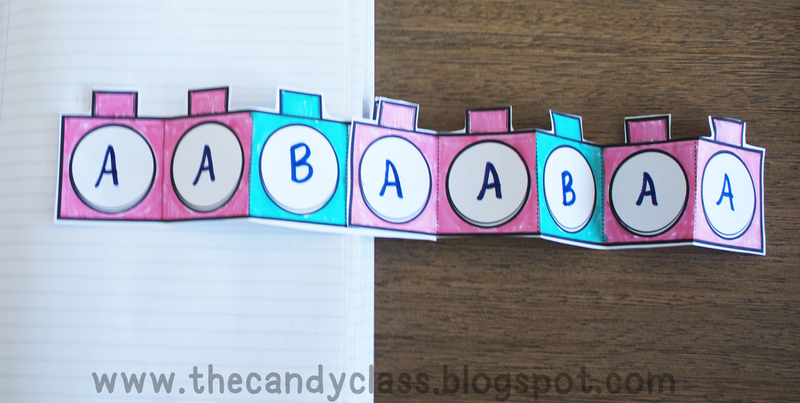 Students can have multiple, small trinket toys that represent targeted letters. 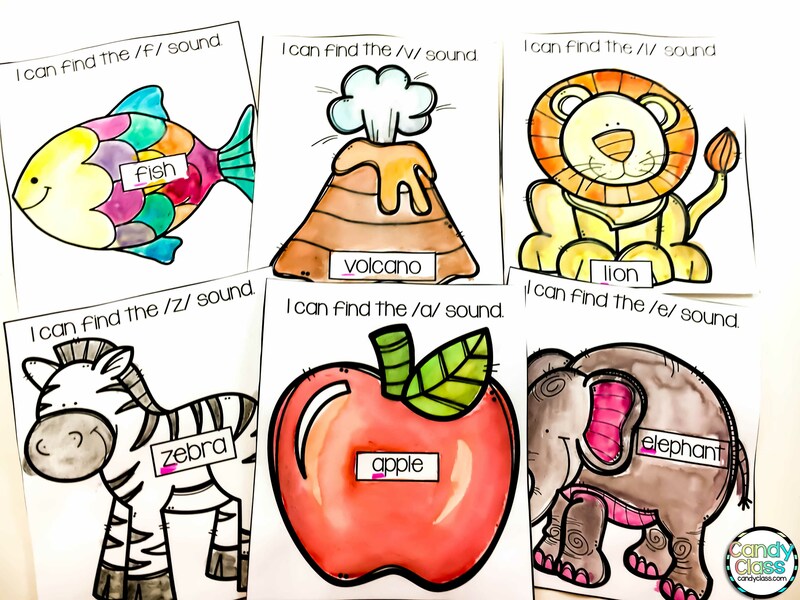 Students can sort them by beginning sound by simply matching them by a letter card. 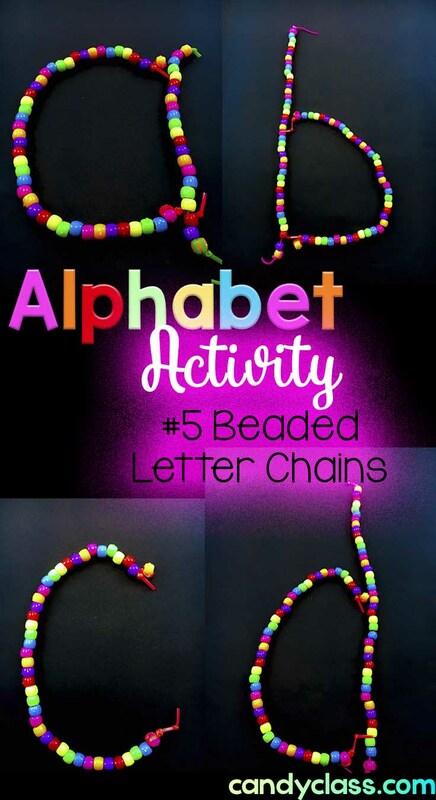 Students can have an alphabet journal and illustrate one of these under each letter too! Students enjoy creating alphabet books! 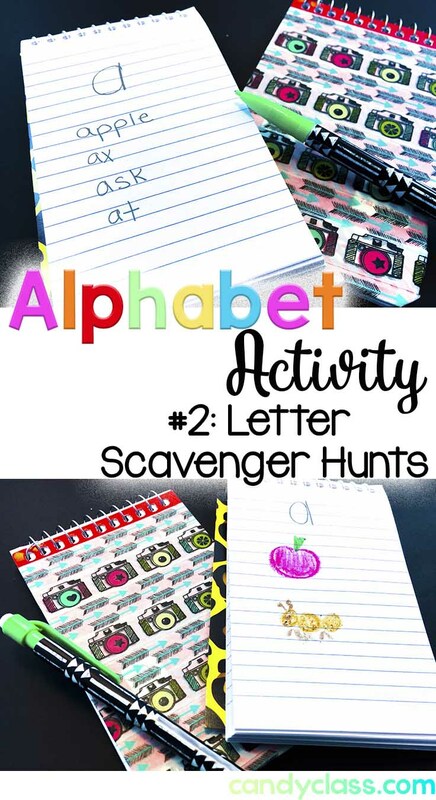 The ones I created have 12 different activities for each letter. If you don’t have time for that many activities for each letter, you can always choose from the different activities easily. 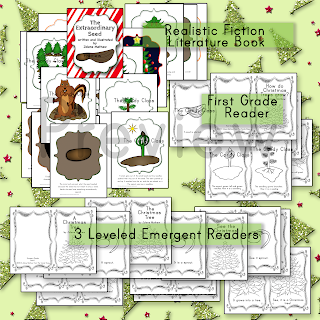 They can stand solo as a book or be used in an interactive notebook. 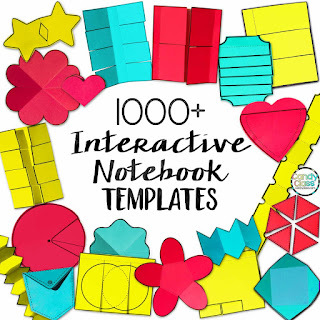 Best of all, you get a lot of activities stored on just a single page in an interactive notebook! It also really helps because students can revisit their interactive notebooks and take ownership of their work because it becomes a published work. You can find the alphabet bundle by clicking here. This is a very popular activity (and I am not sure who came up with it, so I can give them credit). 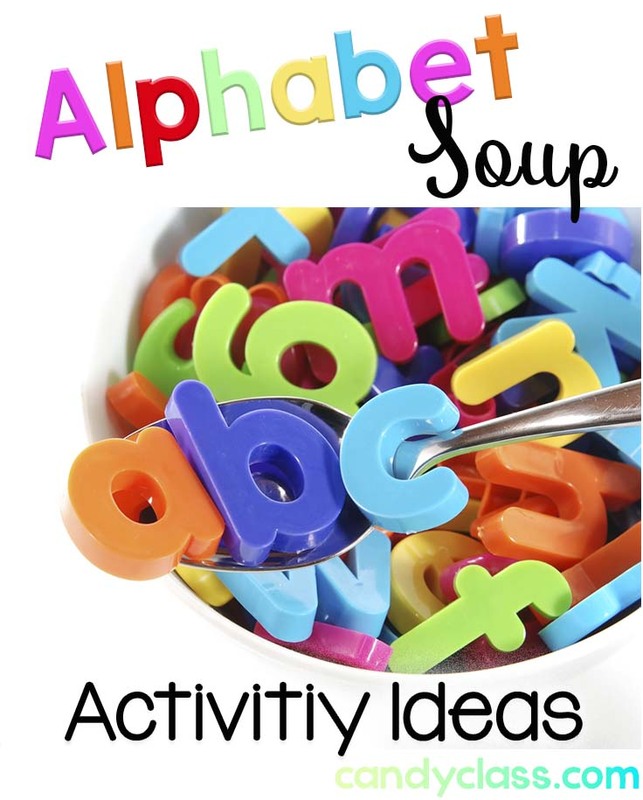 Put some magnetic letters in a bowl or pot, give students some spoons, and let them scoop up letters. Their response to what they scoop up is very versatile. 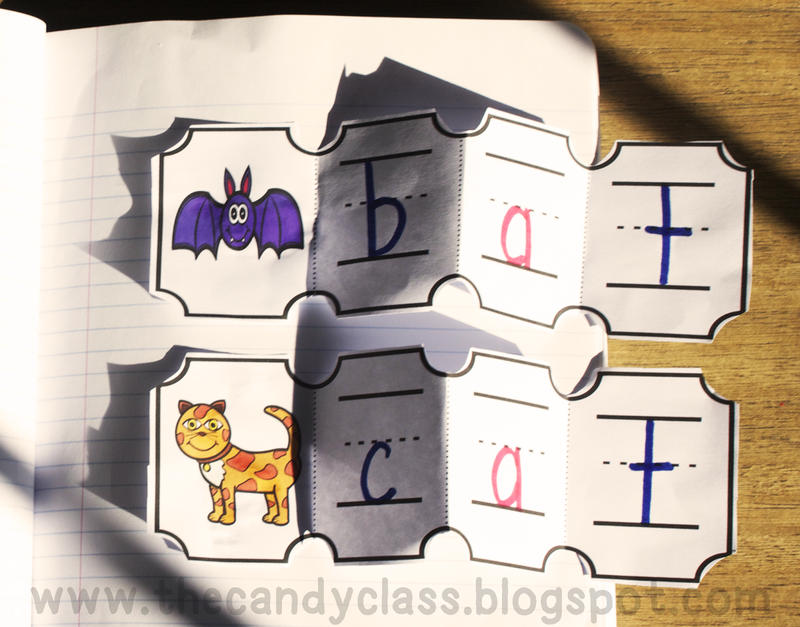 Students can then write the letters, form the letters with some clay, or form words with the letters. They could also collect all the letter a’s to make a big letter a. So many possibilities! 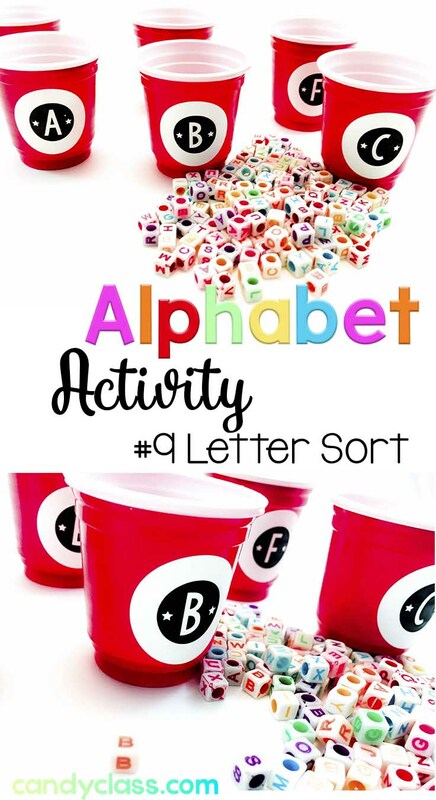 Get some letter beads or any letter form that you can fit many into a cup, and let students sort them into cups. You get the letter A Flip Flap Book for FREE when you sign-up for my free newsletter! Get the free letter A book by clicking here or on the picture. Click on the image to link to Blog Hoppin’ to find out about more stores throwing sales! 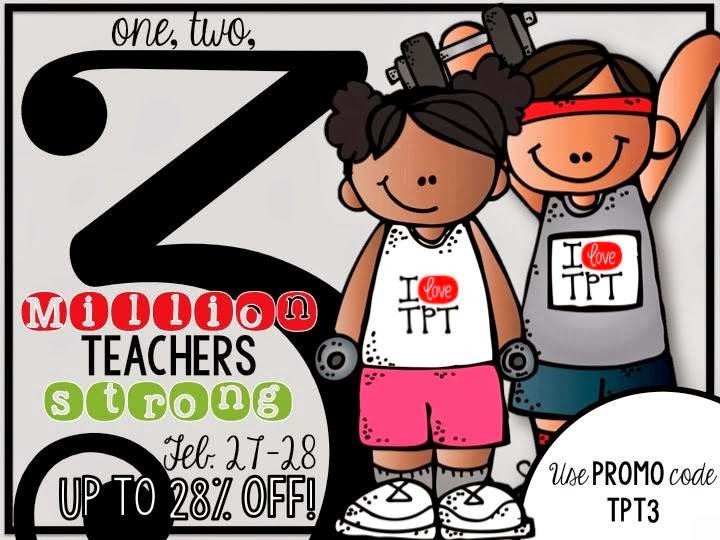 Don’t you just love site wide sales at TPT? I sure do. I can’t decide if I like the buying or the selling part more, lol! My goal is to not spend more than I make, but that is going to be HARD! 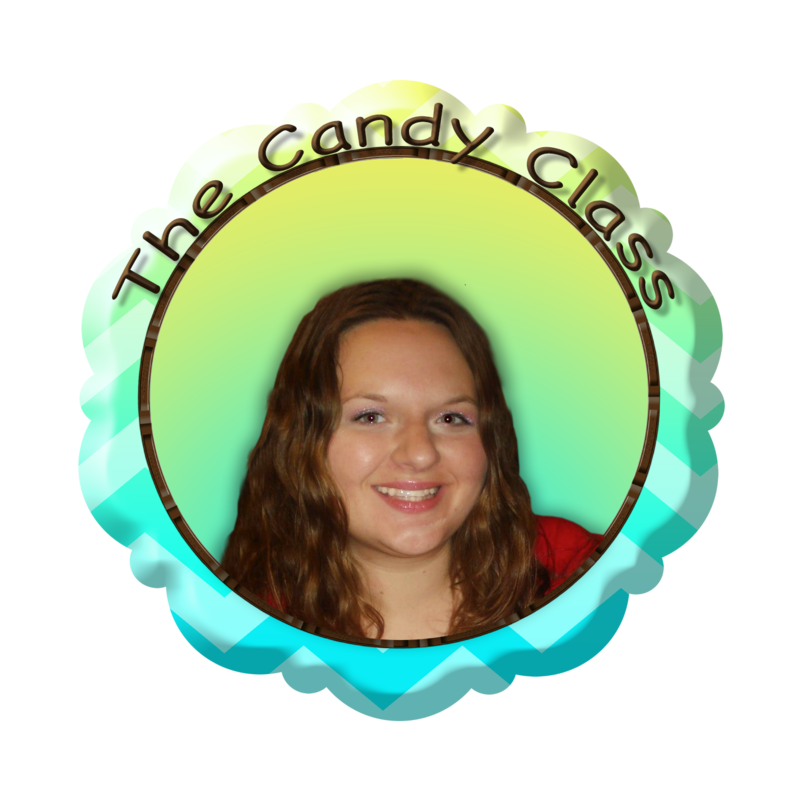 I am planning to stock up on some clip art (yes, even though I make clip art, it is such a HUGE time saver for when I make my curriculum products. Plus, I feel like I am gathering my own personal art collection. I just love art and having a vast array of different styles.) I also have plans to buy some curriculum resources too. I am still debating on which ones, but I did buy that new Rockin Fluency Phrases set from Cara Caroll and LOVE it (and just realized I forgot to add the promo code!). What are you planning on buying? Everything in my store is at least 20% off! 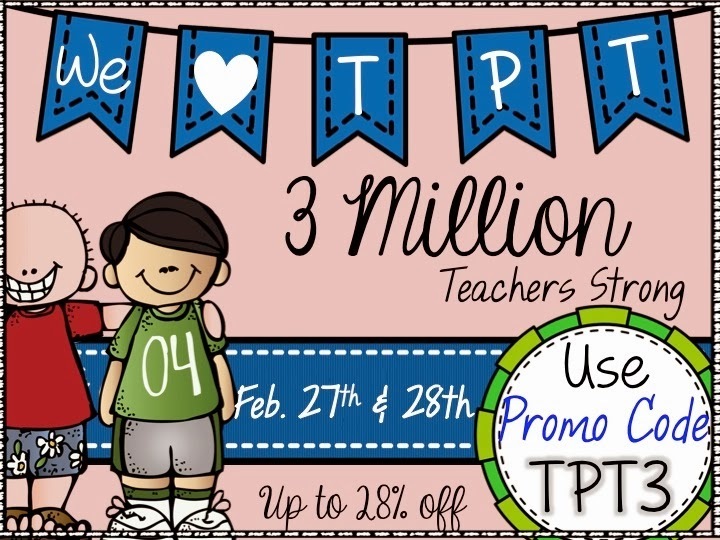 Use Promo Code TPT3 to get an additional 10% off the sales price. Don’t be like me and forget to add that Promo Code! Good thing that was not my big purchase that I am getting ready to make. I am putting a sticky on my screen now. 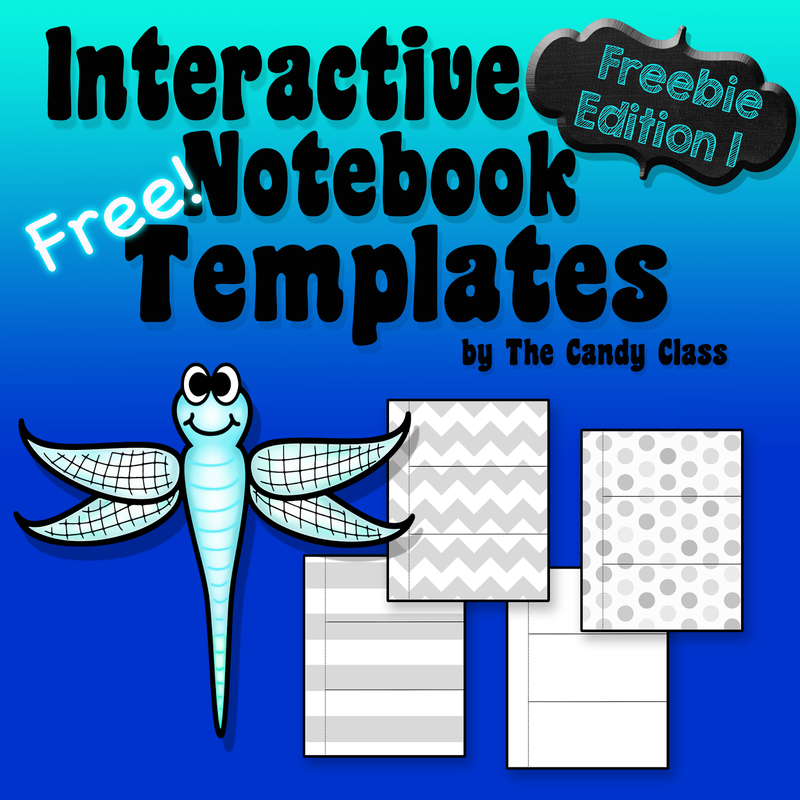 I have a new Interactive Notebook Freebie that is a sample from my new Interactive Notebook Templates 100+ Design Edition for Commercial and Personal use. These come in fun prints of chevron, polkadots, and those bold trendy stripes. They are all in light gray for ink saving, and they print beautiful and text goes on top beautifully. They also include some transparent square that can be stretched to fit on top if you want some blank space. Here is a picture from my Interactive Reading Notebook for Non-Fiction that I published this past fall to see these design template concepts in action. Pretty much the summary one gave me the inspiration recently to make a commercial set of these. Here is the Freebie. Click on image to link. Thanks for stopping by The Candy Class Blogspot! 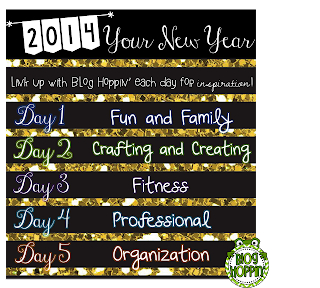 I am linking up with blog hoppin’ for Day 2. 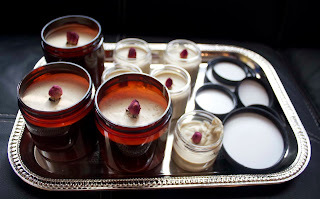 When I am not making graphic art or making teaching products, I like to make my own bath and beauty products. My favorite things to make are facial creams, foundation, and deodorant. I am the weird person that spends hours blocking people from that can of spaghetti sauce in the grocery store as I read the ingredient lists, lol! Just joking, I am courteous and will move out of the way, but the truth is I read all ingredient labels. Here are some pics from making my favorite facial cream named Pomegranate Rose. It includes complete luxury oils such as pomegranate oil, pumpkin seed oil, evening primrose, mango butter (yes, that exists and is completely made from mango kernels! ), apricot kernel oil, and more! The only unnatural thing I put in it is a non-paraben preservative at 1% because bacteria is not a good thing at all and will grow in any product made with water in it. Just like teaching, it takes some know-how, preparation, and a plan. Instead of just using water, I like to make a tea to use in my lotion. 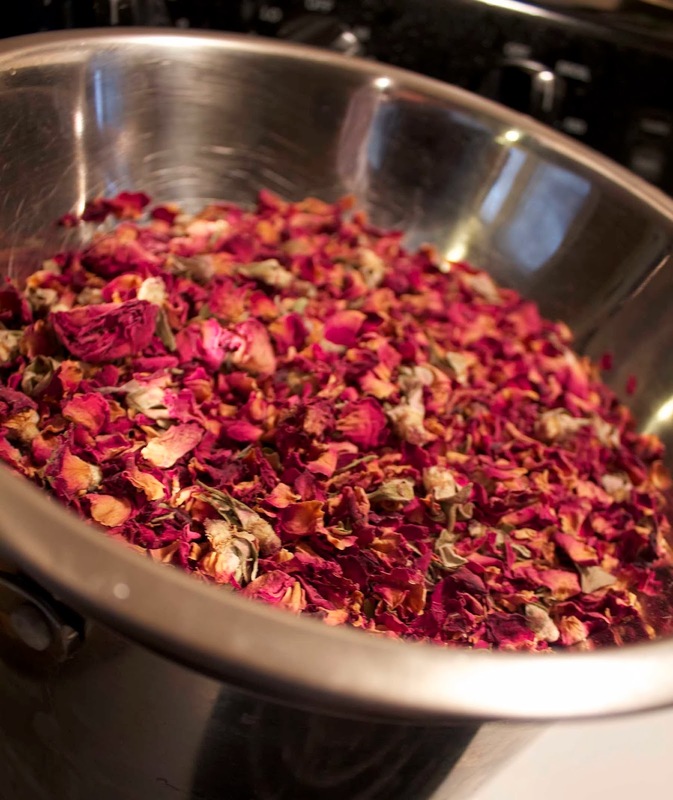 Here I am brewing up a rose tea. I also add aloe vera to the water. Both are known for being soothing to the skin. Lotions are usually around 80% water. I want this to be a cream, so I used less water than that. 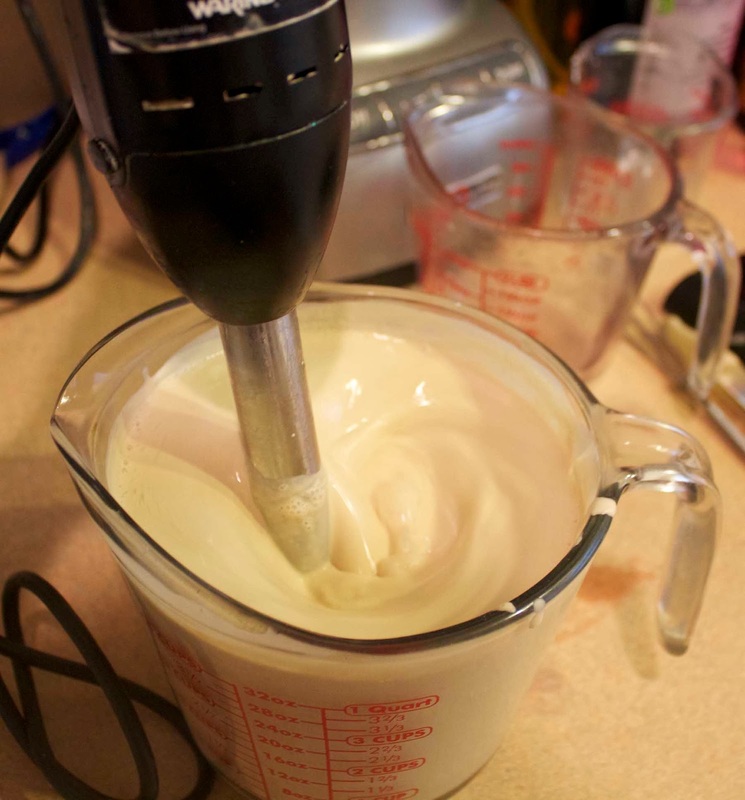 Lotion has four main ingredients: water, oil, and emulsifier to blend them together, and a preservative. 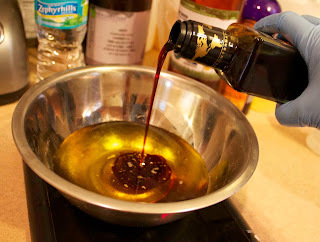 I will have to heat these oils up to around 140 degrees and melt the emulsifying wax and mango butter in it. While I use regular kitchen stuff to make the lotion, I actually have separate everything for my hobby that was purchased for the purpose of making bath and beauty products. Sanitation is very important. I also spray everything down with rubbing alcohol before using anything and wear gloves. The ending result! I top them off with roses and they make awesome gifts! Now this is the part I do not like about my hobby….the MESS! I think it takes just as long to clean it up as it does to make the lotion. That big batch took only about an hour to make. Even though it was messy, the pomegranate rose facial cream was well worth that mess! Now for the resolution part, see I have been bad about making stuff lately because I have been busy with TPT…I even ran out of my handcrafted deodorant! Alright, before you back away from me, I did buy some from the health store. 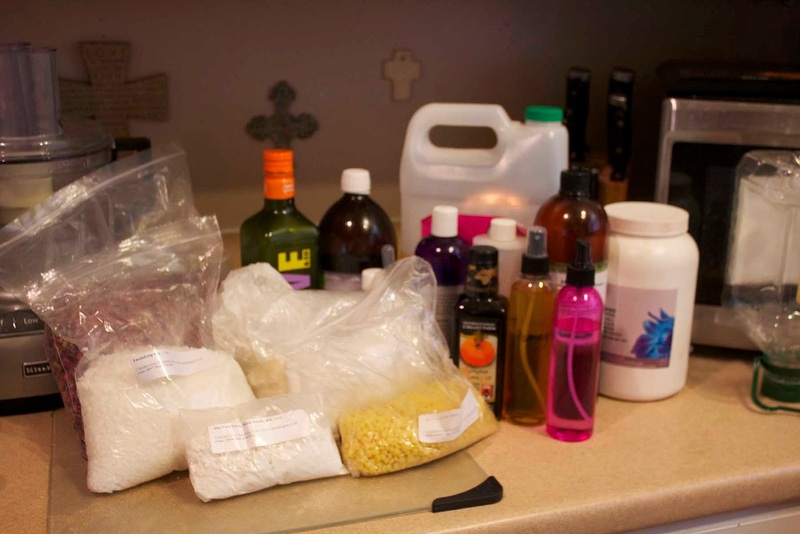 The ingredients are not as good as my formula because they put propylene glycol in it (which is a petroleum ingredient….see you even have to watch what is in the stuff in the health food store!) So my resolution is to make a years worth of deodorant before my purchased deodorant runs out and make a bunch of batches of soap because I am running out of that. Yeah, you might want to back away from me after that because I won’t be buying drug store soap (they put lard aka left over beef waste in most of those, yuck, and sorry, lol, if I just grossed you out.) Also, I am running out of things to give people, so need to make more of just about everything this year. Do you have any resolutions for crafting and creating this year? I want to say thank you for all the attention my little store has been receiving since late October. It truly has been an answered prayer for me because it seemed the doors were shut for over a month before that and everything there was completely silent. It is hard to believe I have gone from around 20 followers at Teachers Pay Teachers to 90 followers in such a short time! As promised, the Free Interactive Math Notebook Entry for Addition Facts 6-10 has been posted! 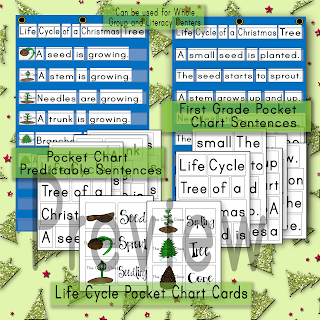 I originally hoped to get this out a week earlier, but my Christmas Tree Life Cycle unit took me 2 weeks longer to create than originally anticipated, Thanksgiving and Black Friday happened, I had previously committed to Facebook Frenzy and needed to create clip art to go with it, and I had to rush out-of-town this weekend for a family emergency. I am still out of town, but brought my computer with me and a determination to complete this freebie for everyone! And now it is here with time to use it before Christmas break. Enjoy! 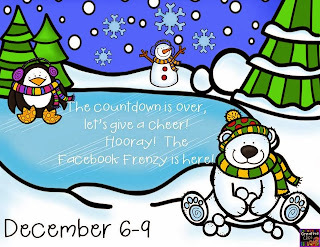 Also, you may want to join the Facebook Frenzy. It is a collaboration of clip artists with freebies! The snowman will lead the way. Hurry! It ends December 9th. Oh, and I am celebrating gaining over 400 followers on my Facebook page by throwing 20% off until December 9th. 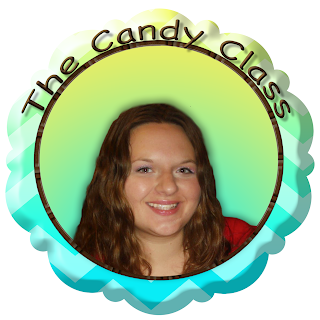 I am also planning a product giveaway soon to celebrate…I just need to get home and figure out Rafflecopter! 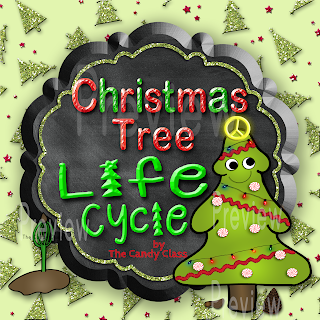 Here is another look at that Life Cycle of a Christmas Tree unit that is on sale! I wrote the original fiction book because I could not find a book dedicated completely to the topic in the big city I live in with well stocked libraries. It is the gem to this unit! 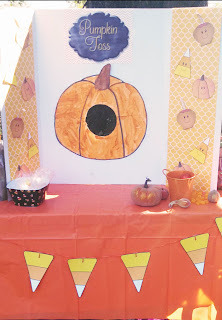 This is from a fall festival for little bear and his friends. 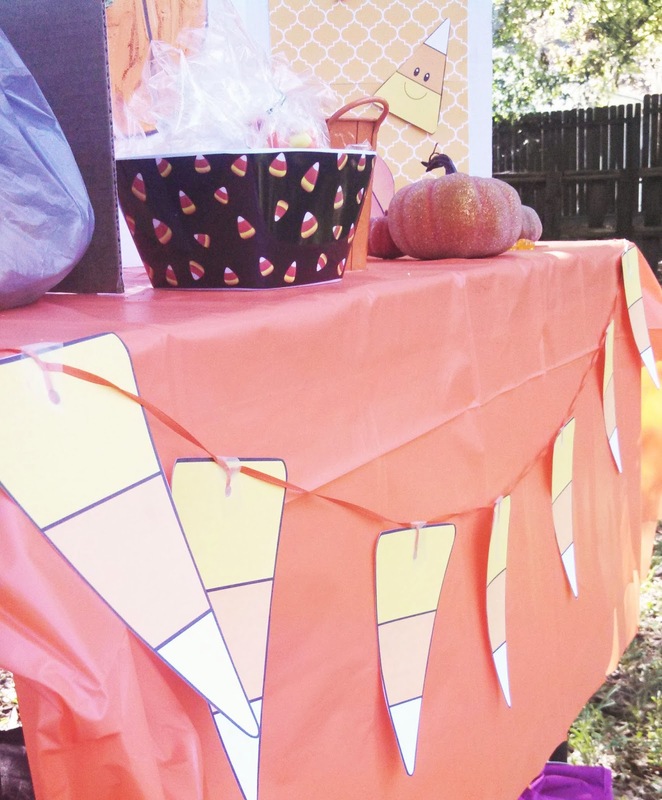 I love candy corn, candy apples, pumpkins, and everything orange this time of year…so I did not have to dig deep for inspiration. 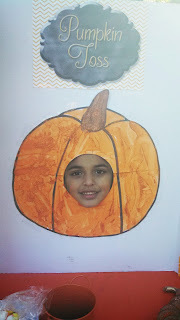 My son painted the pumpkin and attached the clipart pieces. I also let him jump beside me when creating the clipart for this project to teach him some of the tricks in Photoshop and Illustrator. Since it was a pumpkin toss, the children actually tossed tiny pumpkins. Little bear found another use for the pumpkin toss, lol! A closer look at the candy corn bunting. To hang, I used a hole puncher and strung a string through each piece. I made a knot. To keep it from flipping backwards, I taped them afterwards. You could also use clothespins to hang them. 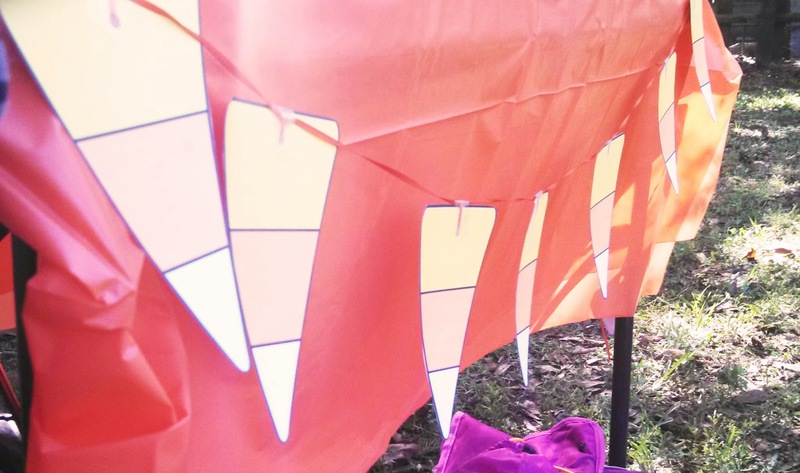 Click on image to download the bunting. There are two images on the page. To make, I made 6 copies of the page, and that ended up being more than I needed for the bunting on my small table. You can’t see in the pictures, but I did have two hanging down on the sides at each corner of the table. Just an idea. Just make sure to select page one when printing multiple copies because I have a credits sheet attached in the pdf and would not want anyone to waste their ink. Also, this is for personal use only. If you would like to share, share the link only. 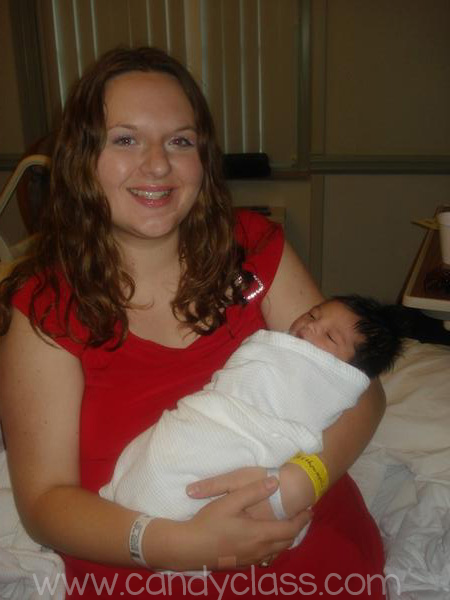 Saturday night, I felt like I was up all night giving birth! Kid you not! And well, I kind of gave birth to an Interactive Reading Notebook for Non-Fiction with cuteness added. Ok, well, not the same…I know, lol, and eating that coconut cream popsicle to keep my eyes opened would make any woman in labor Saturday night probably want to beat me over the head for such a comparison. While I have been laboring with this for the past few weeks with just about every spare moment, I was determined to get this baby out and delivered by Sunday morning, and I thought it would not take that long to finish. Well, one extra hour turned into two as I persisted to finish it, and two into four because I am a perfectionist….until it was 8:30 am and the little interactive reading notebook was finally smiling back at me on the screen…. literally that little penguin was smiling as she held her composition reading journal in her little penguin hands. Every page is truly interactive! Each page has a moving part. Your child or class can revisit them like an archive throughout the year for review. 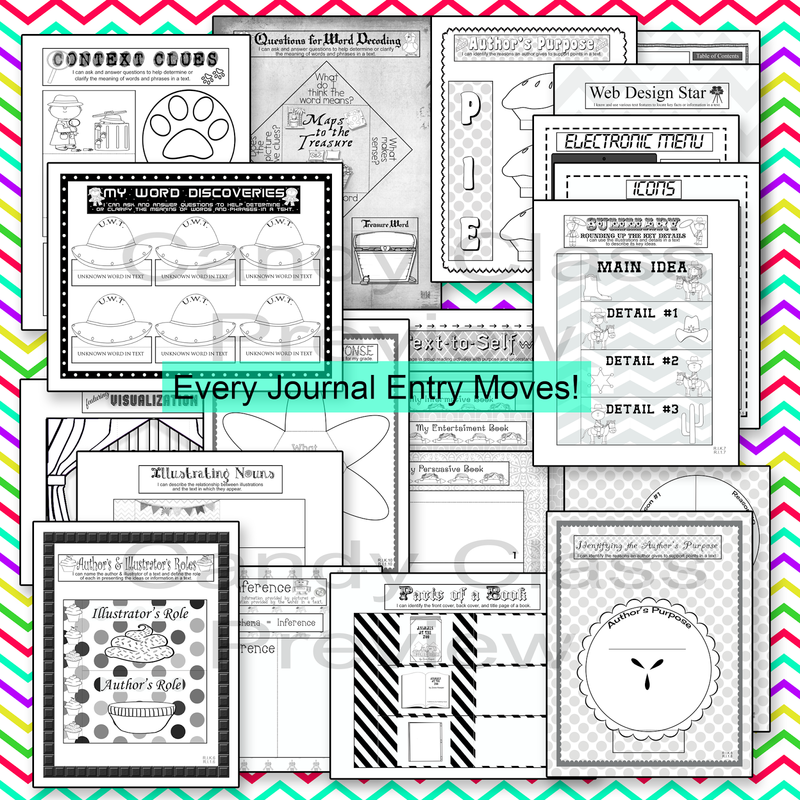 These journals make learning relevant, kinesthetic (hands-on), visual, and fun, fun, fun! Don’t overlook the fact that it includes 27 blank templates for personal use! And did you see it has some science activities with it! I tried to make the preview above big if you click on it…didn’t work out, but you can download a pdf preview for free that allows you to get a close up look of the items in it in my TPT store. Just click on the image to lead the way. Includes photographed PowerPoint instructions. That way you can project them in your classroom. A grayscale pdf and color pdf is also included. Oh, and this baby was 156 pages long!